We offer a fully integrated course package of materials to families with no hidden extras. Each package is made up of four elements – fees, books, kits and delivery. Science and Maths kits to complement the courses range from £20 for Infant science kit to £197 for the primary maths kit. 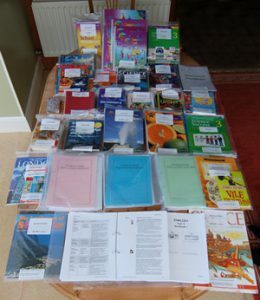 All course materials are despatched by door-to-door courier service and costs are determined by weight. This web site gives a full overview of our services. For further information, please contact us using the email link or telephone the WES office on 01228 577123. We are always happy to chat to prospective clients in the UK or overseas.